We have 2 memorials this week (Monday at 11 am & Friday at 3 pm). Then a baby shower on Saturday at 1pm! Sunday: Elks breakfast 9 am - 11: 30 am AND Super Bowl Potluck! February 4th - Elks Breakfast 9 am - 11:30 am, Come early and enjoy a good breakfast. Keep in mind the biscuits & gravy go fast!!! Stay and watch the Super Bowl 52 (also known as Super Bowl LII) between the Philadelphia Eagles and the New England Patriots on the new BIG screen TV. Super Bowl 52 will be played in Minneapolis at U.S. Bank Stadium. The stadium seats 66,200, but can be expanded to fit up to 70,000 people! Justin Timberlake will headline the halftime performance. This will be Timberlake's third time performing on the Super Bowl halftime stage, giving him the distinction of having the most appearances by an individual entertainer. February 10th - Come celebrate the Elks 150th Anniversary at the Valentine Dinner & Dance - Buy tickets at the bar for $10 per person. Then stay and dance to the music of Good In the Middle at 6 pm. See flier below for more information. 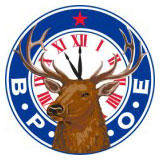 March 10th - Bi-Annual District Initiation at the Westminster Lodge (3 pm & dinner at 5:30 pm). Hosted and performed by the Lakewood Lodge. Note: New members and candidates can go to this Initiation or the September 29th Initiation. April 8th - CNW Workshop at the Golden Lodge. Breakfast will be available. April 15th - District Deputy Meeting will be at Tri-City Lodge at 9 am. June 1st - Mark your calendar for the Annual Golf Tournament at the Broadlands Golf Course in Broomfield (shotgun start at 7:30 am). This includes lunch and prizes. Look for more information to come. September 29th - District Initiation at the Golden Lodge at 4:30 pm. Dinner at 6 pm. Note: If you have any questions about CNW workshops, District Initiation meetings or the District Deputy meeting please talk with Bob Cramer, Leading Knight, Acting Exaulted Ruler. Raffle tickets for the Sig P320-like handgun and the Henry's Golden Boy Long .22 rifle are still available. The drawing will be held at 2:00 pm on Super Bowl Sunday. You need not be present to win. Tickets are $10 each and can be purchased at the bar. The proceeds go toward the Mike Elliott fundraiser held on January 13th. Don't miss the February 7th lodge meeting where nominations for the new officers fiscal year 2018/2019 will be made. The election will be held during our second meeting on February 21st. Support your lodge by participating in this important part of Elkdom.